Amsterdam, The Netherlands – Royal Philips, the global leader in lighting, today announces a world’s first: Philips Hue tap, a clever little switch which makes controlling your favorite hue light scenes even easier. Being kinetic-powered no batteries are needed. Philips Hue tap needs no batteries as it operates using kinetic energy – simply through taps from your finger. As a result, it has a remarkable zero watts of power consumption and needs no mains power source. Meaning it’s not only smarter, but greener and hassle free. 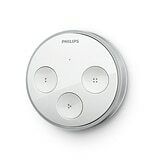 Philips Hue tap control requires the hue bridge found with all starter kits for Philips Hue and Friends of Hue products. Hue tap is available after summer in North America and Europe at selected retail outlets for US $59.95 / €59.95 (RRP). Philips Hue is a personal wireless lighting system for homes that brings endless possibilities for you to get creative with light and personalize it to suit your lifestyle. Hue’s pre-set light recipes can help you relax, read, concentrate or energize with the optimum tone of white light. Or for a little extra ambience, use Hue’s color picker to create scenes with up to 16 million different colors, save them and share them online with the Hue community.